Ottawa Construction Association Headquarters | RECL | Ron Eastern Construction Ltd.
Tradespeople have started work on the $2.7 million renovation at the Ottawa Construction Association’s (OCA) new headquarters at 9 Antares Dr. in time for the association to move there from its current location at 196 Bronson Ave. at the end of June. 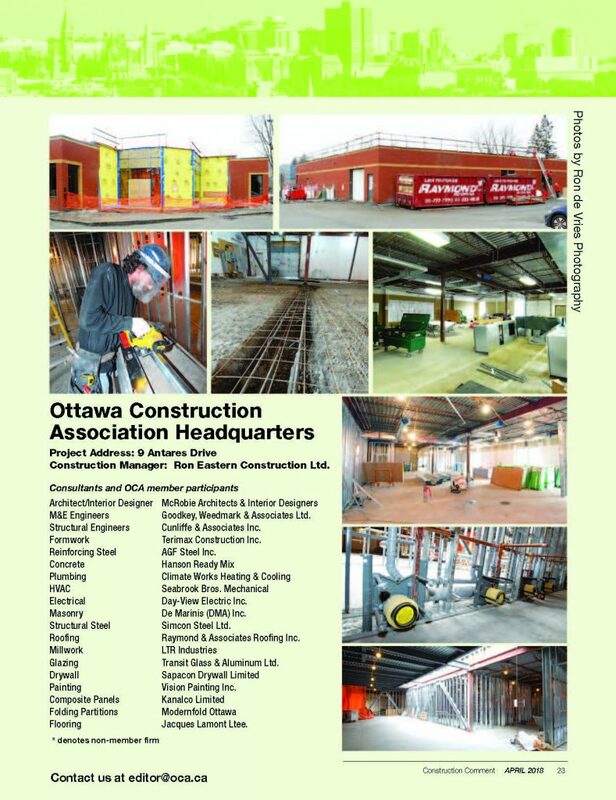 Ron Eastern Construction Ltd. (RECL) is overseeing the project as construction manager, says OCA president John DeVries. RECL “has assisted us through the process of architect and engineer selection under a CM (Construction Management) contract.” McRobie Architects has designed the renovated structure.